Little Snow White, so innocent so demure, she's been that way for years. First, she was chased from the castle by her Stepmom's woodman. Then, after hours of walking, she reaches a tiny and messy cabin, finds some tiny beds, and passes out. Then she's woken by a bunch of small and dirty miners who tell her that to stay there she has to clean the house after she had just told them someone had just tried to harvest her heart for her step mom! The list of hardships poor Snow went through go on and on until she ends up in a crystal coffin. It's time that Snow White got a little sassy. This polite façade she's been sticking with is just not doing her any favors. When that prince wakes her from her sleep in the crystal coffin she's going to get woke in more than one way. No more dusting for dwarves. And no more taking any more trouble from her stepmother queen, or anyone else who decides to tell this perky princess what to do. 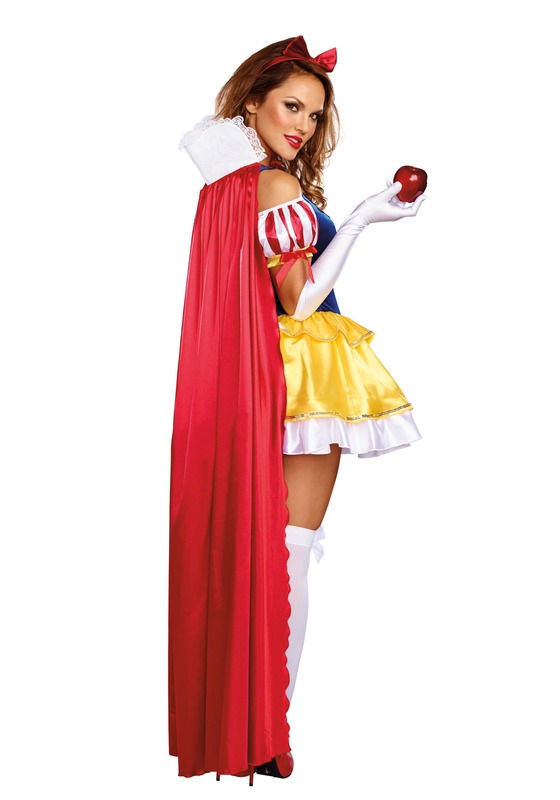 We think this sassy Snow White might be even more charming than the original. No riding on the back of the prince's white stallion. Ms. White can handle her own bronco, thank you very much! She's ready to get out of the forest and back to the castle in her seductive ensemble. The off the shoulder sleeves and short billowy skirt should really get the kingdom talking. Let mommy dearest know, Snow White is back in town and there's no question about it: she's the fairest of them all. I am so happy with this costume! it's a bit pricey but totally worth it. For reference I got a size small (5'4", 130 lbs, 34 DDD) fits like a glove. Plus you can wear a normal bra - the back is completely covered.